Sky surveys have had a long history, and have led to some of the most important discoveries in astronomy. The next major systematic sky survey was not begun until 1700 years after Hipparchus. 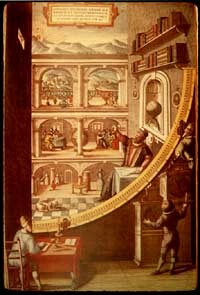 Tycho Brahe, a 16th Century Danish nobleman, studied the motions of the planets from an observatory on his property. Brahe and his assistants made naked eye observations with the help of a large sextant, a tool that sailors used to find stars. Brahe's survey took decades, and was more precise than any survey before. After Brahe died, data from his survey was passed on to his assistant, Johannes Kepler. Using Brahe's data, Kepler deduced that all the planets travel around the Sun in elliptical orbits - forever laying to rest the idea that the Earth was at the center of the universe - and derived his famous three laws of planetary motion. Kepler�s work, based entirely on Brahe's map, stands as one of science�s crowning intellectual achievements. Our Milky Way Galaxy is similar in many ways to this one, found by SDSS. Then, in 1924, Edwin Hubble of the Carnegie Observatories in Pasadena, California made a new map. He observed a series of distant galaxies, and found that light from those galaxies was redshifted - that is, light waves were stretched out like sound waves from a passing siren. The further away the galaxy, Hubble found, the greater the redshift. Hubble's observation showed that the universe was expanding, meaning it had started at a single point called the big bang about fifteen billion years ago. 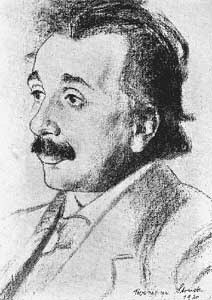 When Einstein heard about Hubble's discovery, he realized that his equations predicted the expanding universe all along, and called his constant term his "biggest blunder." Today, the idea of the expanding universe is the basis for all of modern astronomy. Since Hubble's time, a few more sky surveys have been conducted. But most astronomy research focused on observing a small number of individual objects, often chosen because they appeared somehow unusual. By choosing unusual objects, astronomers were attempting to observe and categorize a broad range of celestial phenomena to discover and constrain the limits of "what�s out there." But some astronomers using this research method found that calculations they thought were simple and straightforward were actually difficult. For example, they found that it was particularly hard to determine the expansion rate of the universe (called the Hubble constant), the density of the universe, how galaxies cluster together, and even what makes up most of the matter in the universe. The reasons for these difficulties are clear: astronomers had too little data to work with. It was as if they had been trying to study the oceans, but seeing only a small patch of the North Atlantic. Astronomers realized that it was time for another map of the entire sky, one that could see large portions of sky to distances up to several billion light-years. Now that technology has become advanced enough, this map is being created by the Sloan Digital Sky Survey. What do we mean when we say the SDSS will map the universe? 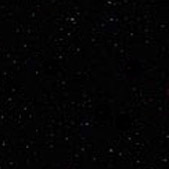 To the SDSS, mapping means measuring the positions and properties of all the hundreds of millions of celestial objects its telescope can adequately observe: over one-quarter of the northern sky. 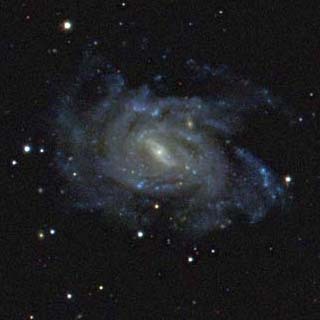 To find these objects, SDSS's astronomers must first use their telescopes to take a picture of the sky over the whole survey area. From this first set of observations, almost all objects can be categorized into well-recognized types such as stars, galaxies, and quasars. This survey also measures the objects' positions very precisely. The survey is, in some sense, already a map of the sky: it tells astronomers where to look to find any of the objects. But astronomers are also interested in measuring the distances to these objects, to get a full three-dimensional picture of "what�s out there."